New Center Park — good done daily. A restored green space located in the heart of a thriving city district. Each summer, New Center Park comes alive with films, music, and weekend dance parties that draw in hundreds of visitors from around Detroit and the suburbs. We built an attractive brand around the season’s events that framed the eclectic energy of the park. 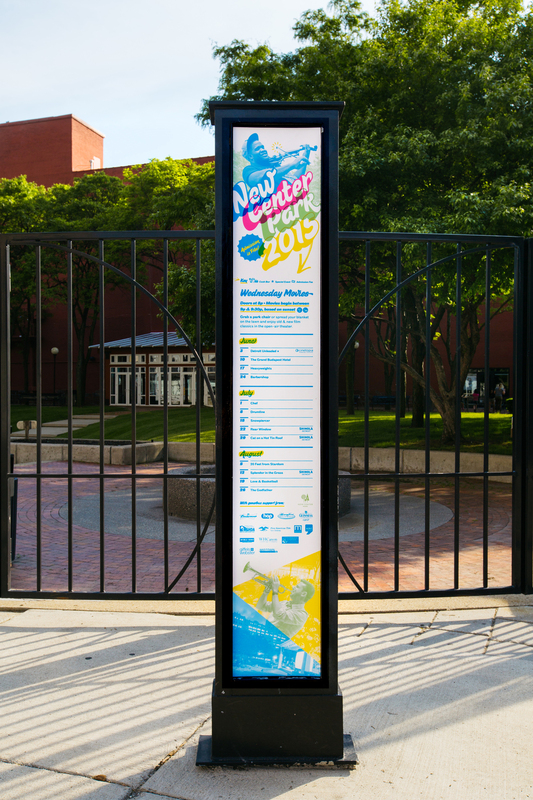 Design consisted of a summer events schedule that found delivery through direct mail to residents across the city’s Midtown, Downtown, and New Center neighborhoods. Sign posts were designed to flank two of the park’s main entrances. Each of the three signs represented a theme in the park’s summer activities and disclosed dates and times. Banner wraps for fences were fashioned around the outer perimeter of the park.